Other: son of Henry Dodgson Esq., Derwent House, Cockermouth. 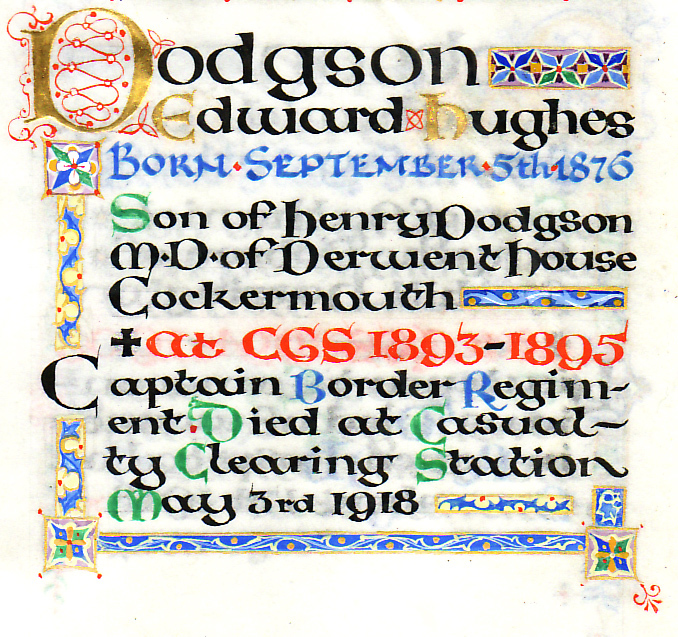 Edward Hughes Dodgson was one of eleven children born to Cockermouth Doctor Henry Dodgson and his wife Frances. Sadly his father died in July 1882 leaving his mother to bring up the surviving seven daughters and two sons. His father left nearly £8,000 in his will equivalent to £386,000 today. The Dodgsons had lived in the Cockermouth area for several generations and although his mother was born in London her mother was also from the area. For over 40 years the family home was Derwent House, Crown Street, Cockermouth. Edward along with his older brother was first sent to Pocklington Grammar School in Yorkshire and then moved to Carlisle Grammar School. Edward made an impact on the sports field; he was good at the steeplechase and the “The Carliol” published the following glowing tribute to him in July 1895 “We are sorry to say that our athletics will suffer by the retirement from our midst of………..and E.H.Dodgson. We can only say that we hope they will do as well in their new careers as they have in the cricket field”. He won the chemistry prize in 1895. His brother Henry followed in his father’s footsteps and became a doctor. Edward qualified as a land agent and surveyor in 1904. However the CWGC lists him as a sapper in the Royal Engineers, his parents’ headstone also lists him as being in the Royal Engineers. The most likely scenario seems to be that when in 1916 the Royal Engineers formed the 5th Field Survey Company, qualified surveyors were drafted in from other battalions. The drop in rank is surprising. He died at a casualty clearing station and is buried at the Aire Communal Cemetery. He left £2,200 in his will equivalent to £100,000 today. Edward married Annie Ritson in the summer of 1913. Of Edward’s eight surviving siblings none appear to have had children. His sister Grace travelled the world as a nurse. Janet, Frances and Mabel went to Canada but were still unmarried in their forties. And Lilian and Margaret married in their mid forties. Edith hasn’t as yet been traced. ” Until the day breaks and the shadows flee away”. The Dodgson family were friends with the Gilbanks family. f) WO 95/2402 the Border Regt War Diary for April 1918contains no reference to Edward.